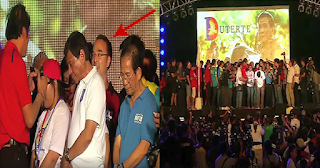 SHOCKING: Sen. Alan Peter Cayetano was Slammed By Marcos Supporters! Along with the heating up campaign rallies, presidential bets are also busy making sure that their running mates will also win. This is very much seen on Duterte-Cayetano tandem. There is actually a TVC campaign that Duterte is blunt in telling the public not to vote for him if they will not elect Cayetano as well. However, this was not the same scenario in a campaign rally attended by the two. A supporter of Mayor Duterte was about to offer a prayer for him, when the man holding the mike frankly told Cayetano (who was on the same stage) that they support Bongbong Marcos for vice president. Senator Cayetano's response was not heard on the microphone, but it was seen that he's embarrassed. Ang hard naman nyan. Nakakaawa tuloy si Cayetano.